Want to become a welder in New Mexico? Here, you can find the list of the best welding certification schools in the state as well as a bunch of useful info about welding career. Learn about welder’s basic skills, salary, job options and so on. This article will help you to learn the most essential info about welding. 1 Welding in New Mexico: What is Welding? 2.1 What It Is Necessary to Be a Welder? 3 Where Can Certified Welders Work in New Mexico? Welding in New Mexico: What is Welding? If you want to understand what is welding, we prepared a simple answer for you. In fact, it’s a process of connecting metal or thermoplastic pieces together fusing them. It means that welder should use various tools to heat and melt metal. Welders only fuse pieces and don’t use any additional materials such as glue. It means that a final construction is more firm, solid and can be manipulated easily. Becoming a welder in New Mexico, you’ll be able to find a whole bunch of career options. There are lots of offers for those who want to work as underwater welders. If you are interested in gas tungsten arc welding, you also can find a job easily. In fact, despite your choice, there is plenty of job offers and you’ll be satisfied and proud of the work you do with your own hands. Consider the fact that there is an incredible outlook for welders in New Mexico. According to the U.S. Bureau of Labor Statistics, the number of job offers for welders will be growing constantly. What It Is Necessary to Be a Welder? A professional welder should be initiative, responsible and motivated. It’s absolutely important as you should be able to work on projects independently. It’s your opportunity to succeed in your career. Welders in New Mexico have an excellent salary. In fact, you can earn a median salary of $50 850 per year ($24.45 per hour) while throughout the country – it’s $39 390 per year ($18.94 per hour). Speaking of the top 10% of welders, in New Jersey, they earn about $87 530 annually. At the same time, welders throughout the USA have an average salary which is about $62 100 per year. Where Can Certified Welders Work in New Mexico? Starting your career as a welder in New Mexico, you can find numerous job offers in various spheres. 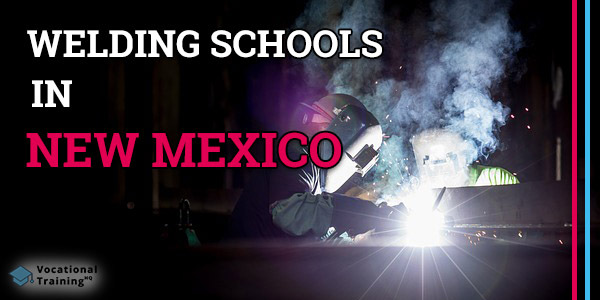 In New Mexico, there are 9 schools that offer a welding training program and are approved by the American Welding Society’s SENSE Accreditation Program. To enroll in any program of the list, you need to have a high-school diploma or GED. Keep in mind that the information in the table may change so we recommend you to double-check it. There are lots of people who are especially interested in welding training and career in Albuquerque. The best option is Albuquerque Job Corp Center where you can get your certification and find a job. One another excellent choice is Central New Mexico Community College. Of course, there are great schools in other cities such as Las Cruces, Clovis, Roswell, Hobbs, Gallup, and Roosevelt. Each school for the list above provides all the essential classes such as Gas Tungsten Arc Welding (TIG), Shielded Metal Arc Welding (stick), or Gas Metal Arc Welding (MIG). You’ve learned some important info about welding and training programs in New Mexico. It’s time to make a decision and start moving towards your successful career.